A decision by the British Home Office to trial the use of drones in monitoring protests and surveying road accidents has been criticized by privacy campaigners who cite lack of oversight as a major concern. Police forces in Sussex and Surrey have been granted government funding to conduct a pilot project testing the use of unmanned aerial vehicles (UAV). Drones are being considered by police across the UK as a cheaper alternative to helicopters. Privacy activists expressed concern the technology could be misused by authorities to target innocent individuals. Several police forces across the UK have already trialed drones, with Northern Ireland using them for security purposes during the G8 Summit in County Fermanagh in 2013. The £250,000 grant from the Police Innovation Fund will enable Sussex and Surrey to buy five more drones to be used for accident scenes, searches for missing people and monitoring protests. “Of course there are cost savings but they can only film, they cannot intervene, they cannot make arrests,” he added. If the trial is successful, the Home Office intends to expand the use of drones by police forces across the country. 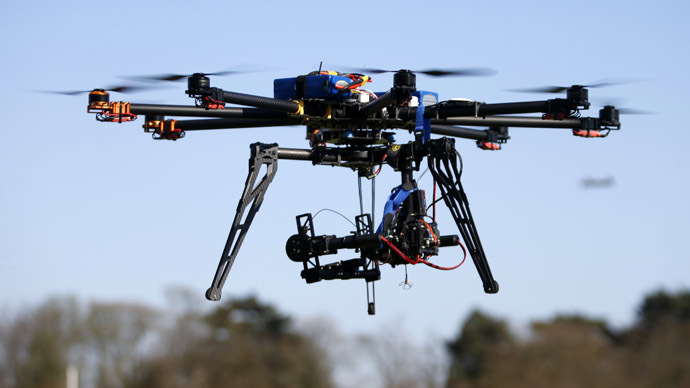 Privacy campaigners have expressed concerns over the implications of UAV surveillance. “This trial will probably end as well as the last one, where they lost control and crashed it into the Mersey, which was better than crashing it into Liverpool,” he said. For police forces however, drones are an affordable alternative to the expense of maintaining helicopters in a time of shrinking budgets. Police and Crime Commissioner Tim Passmore has suggested forces in Suffolk use drones in a bid to cut costs. Speaking to the BBC, he said Sussex police’s £800,000 annual bill for the use of helicopters was too high. “I made it quite clear that we will not be paying that money,” Passmore said.